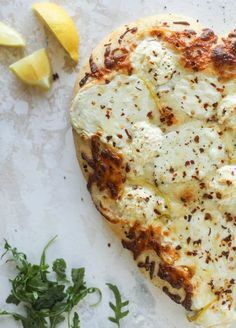 Our favorite white pizza recipe has four different kinds of cheese and comes on a garlic bread crust! Topped with crushed pepper and lemon - tons of flavor! In a large bowl, combine water, yeast, honey and olive oil. Mix with a spoon, then let sit until foamy, about 10 minutes. Add in 2 1/2 cups flour, garlic powder, basil and salt, stirring with a spoon until the dough comes together but is still sticky. Using your hands, form the dough into a ball and work in the additional 1/2 cup flour, kneading it on a floured surface for a few minutes. Rub the same bowl with olive oil then place the dough inside, turning to coat. Cover with a towel and place in a warm place to rise for about 1-1 1/2 hours. After the dough has risen, punch it down and place it back on the floured surface. Using a rolling pin or your hands, form it into your desired shape, like the heart above (sometimes I use baking sheets and do rectangles or free form pizzas – this specific dough will yield one pizza large enough to feed about 3-4 people) and place on a baking sheet or pizza pan. Place the towel back over the dough and let sit in the warm place for 10 minutes. Brush the pizza dough all over with the olive oil, making sure to reach the edges. Add the minced garlic cloves and brush them around to distribute them evenly over the crust. Sprinkle the provolone cheese over the crust. Add on the sliced mozzarella and scoops of ricotta cheese. Sprinkle on the parmesan cheese. Add the lemon zest and red pepper flakes. golden and bubbly. Remove and sprinkle with extra parmesan and pepper flakes if you wish. If you want some greens on the pizza, toss the arugula with the lemon juice and a pinch of salt and pepper. Top the warm pizza with the greens.